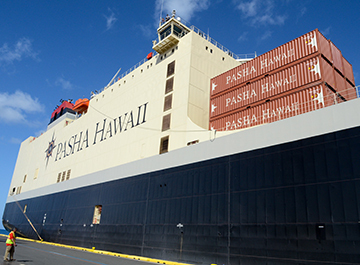 Pasha Hawaii's highly trained and experienced container customer service team operates from 5:00 am to 8:00 pm PT and can be reached at (877) 322-9920 or via email: ContainerBookings@pashahawaii.com. Pasha Hawaii's team, committed to serve our Hawaii customers' needs with an ever-present "Aloha" spirit, are at your service to provide rate quotes, input and execute bookings, resolve problems and receive remittances. If you have specific Container Sales related questions, please contact us via the phone numbers or email addresses listed on Pasha Hawaii Container Services Contact Us. To go directly to our booking page, please visit Pasha Hawaii Container Booking, complete the required information, and we’ll get back to you shortly.